Trust isn’t a quality you either have or you don’t; it’s a learnable skill. Teams and organizations that operate with high trust significantly outperform those who don’t. Teams and organizations led by a high-trust leader are more energized and engaged. They innovate and collaborate more effectively, operate faster, and achieve sustainable results. "Extending trust is the ultimate act of leadership, the defining skill that transforms a manager into a leader." Complex organizational problems that require a change in human behavior cannot be solved with the stroke of a pen, a leadership mandate, a training program, restructuring, or changing a system. While these things can be helpful, all grand strategies must, eventually, degenerate down to real work done by real people. 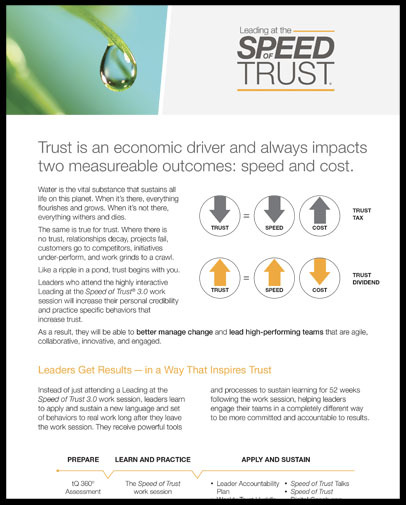 Leading at the Speed of Trust™ is leverage that dramatically impacts business outcomes through changing the performance of individuals and teams. This is not a separate initiative; rather, it is about HOW individuals and teams do their current work. Leaders who know how to create a high-trust, highly-engaged culture create the ultimate, long-term competitive advantage. The Speed of Trust Transformation Process™ drives a scalable, simple methodology that easily guides individuals, leaders, and organizations to become explicit and deliberate about creating a high-trust, highly-engaged culture focused on results.